CONTACT US · PRESS · PHOTOS · HEALTH BENEFITS · WHO WE ARE? Minigolf is great for your health and safe for your heart! A Putt Above is proud to be wheelchair and walker accessible so that these health benefits are accessible to all! Short bouts of physical activity such as walking while playing minigolf can help you control your cholesterol and reduce your blood pressure while having fun! Minigolf can be an element of a heart attack/stroke rehabilitation program to improve stroke and heart attack patients' balance, eye-hand coordination. Get even more health benefits by playing the entire 18 holes of minigolf. Walking a Minigolf course means that you will be walking around 2,000 steps which will help you reach your goal of 10,000 steps per day (daily heart health recommendation for the average adult). A high energy interactive game of targets improves your health AND your fitness! Moderate and high intensity games improve your fitness so that you can do more with less effort in your daily life. Any physical activity helps build and maintain muscle and bone. This keeps you independent as you age. Fun activities like indoor minigolf have helped people in overcoming aches and pains while getting them out, walking, and improving balance. Work on your golfers balance as you try for a hole-in-one! 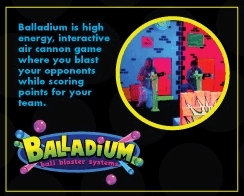 Physical activities that demand eye-hand coordination such as Minigolf and Balladium develop hand eye coordination. This improves a child's ability to read and write and adult's ability to maintain coordination with aging. A Putt Above offers a stimulating visual environment with the glow in the dark artwork and for an extra challenge try it with our 3D glasses. Play together with your children (or grandchildren) and improve your coordination together! Light intensity physcial activities such as minigolf enhance your mental health and boost your self-esteem. Playing with others gives you the chance to socialize with others in a fun-filled atmosphere. CALL TODAY for more details and information on how to book your next party or event.